Brand New Solid NZ Pine Child Table + Four Chairs. 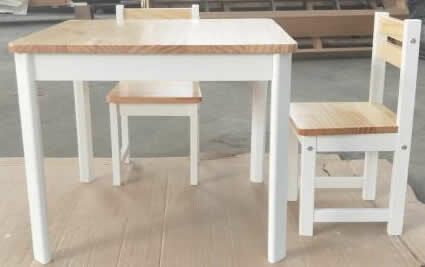 White Legs Wooden Kids Table Set, Child Chair [ALJMTS04W] - $218.00 : ALLBABY, all about baby! This Wooden Child Table set includes one Square Child Table and four Chairs. What a great indoor furniture for kids to have. Now, reading, drawing, colouring, making play dough, folding paper, playing board games, writing and even eating can all happen here at their very own table! Built to take adults weight, the table and chair set will also be the convenient place for you and your kids to spend some quality time together doing activities that your kids enjoy. This is a great buy! With years of fun and usage at such an affordable price! They are Coated by Non Toxic Clear Lacquer so you can see the natural beauty of woodgrain patterns.